As we learned in the last Mental Muscle post, visualization is a mental practice, or training technique. It can be used to strengthen skills to up your game. 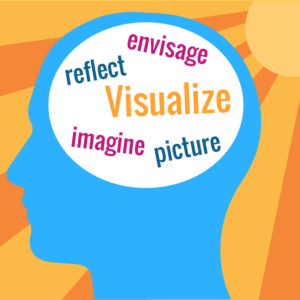 To recap, visualization is your ability to create mental images. You can see these images from the perspective of a spectator (seeing yourself outside your body) or as an actor (seeing the event from your perspective), but the most important part of visualization is the quality of these images. Images will always, by definition, include a visual component, but they could also include your other senses like hearing, smell, touch, and even taste if applicable. Remember that your brain cannot distinguish actual events and images from these events (Cool, huh?). The goal of visualization is to make new pathways (links) within your brain. With strong visualization technique, you can program your brain to think that you have accomplished or you’re able to achieve a certain task or skill. This is why it’s important to make sure that these images are realistic, positive, and that they are in your control. In the last Mental Muscle post, I briefly went over the different ways that you can use visualization to improve your athletic performance. From using visualization to correct mistakes to using the technique as part of a recovery plan. Now, let’s dive deeper on how you can apply visualization to enhance practices, to prepare for bouts, and to use as a post-performance review. 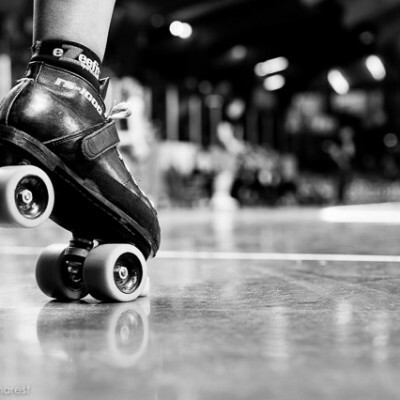 Just as you would schedule in your Roller Derby Athletics workouts, you can also schedule in time for visualization, and make it a part of your training regime! As I mentioned in the last post, the quality of these sessions is more important than the length. You need to make sure that you have control over these mental images, and that these images are realistic and positive. So, how do you begin? First off, it’s OK to start slow. Visualization is a skill, so just like your plow stops started off a little rusty, the quality of your images will improve with practice! At the beginning you might only be able to hold quality images for twenty seconds, and that’s fine. Go in with a goal/plan of action. Going into a session with a goal helps your focus, by knowing what you want to accomplish with this visualization session. Are you visualizing to improve a skill? Maybe to review strategy? It’s important to know what you want to achieve in order to help you stay on task mentally, and make those images clear. 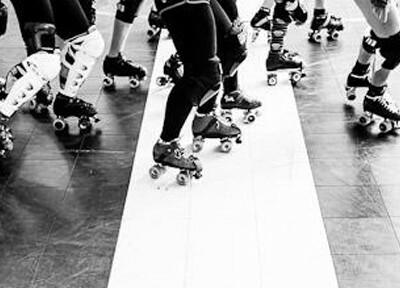 Have you ever been taught new footwork or a blocking technique at practice that was challenging? Well you can use visualization to help break this technique down into steps or even perform the technique at a slower pace. See yourself be successful step by step, until you can see yourself perform the technique in real time. Pack strategy is fast-paced and can be complicated! Seeing yourself accomplish key strategies will help not only with the correct implementation, but also with your reaction time. Just as with breaking down a complex technique, you might need to start in steps or at a slower rate before reaching a real time pace. Picture the game scenario unfolding in slow-motion several times until you can work the visual up to full speed. If you are injured and cannot be on skates, or you’re not cleared for contact, you can use visualization sessions to stay current on your skills and team strategies. Picture yourself performing the drills that you saw at practice. When you see these images, feel the movement (without having to move) in your body. Once you’ve practiced this mental skill under optimal conditions, and started to get the hang of it, you can start to bring your ‘mental muscle’ to other practical and real-time applications. Next up we’re going to dive into three scenarios where mental imagery can come in handy. Right before your practice begins you can find a quiet spot and engage in a session just as you do at home! However, this isn’t always an ideal time to breakdown technique. Instead, you can use this time to review strategy, or to help you get into your optimal performance zone. You can use visualization to either pump yourself up or to relax. These images can be of yourself, or of images that represent activation or relaxation. If you are using visualization to self-regulate, it’s very important that you incorporate feeling into the mental images that you are creating. If you are seeing images that represent calmness, then you need to feel the tension slip away from your muscles and mind. Same goes if you are using visualization to get yourself pumped for practice, you need to feel the confidence and strength run through your body. Try changing your body position when visualizing to self-regulate. When you are trying to relax, it’s a good idea to stay seated or even lying down when visualizing. When you are trying to activate yourself, it’s a good idea to stand up and if possible move your body to correspond with your mental images. During practice, you can modify your visualization sessions to run and review drills in your mind. Once a drill is explained by your coach, see yourself successfully accomplishing the drill before executing it. This will help with clarifying the drills, as well as help with your overall confidence. Since there are a lot of distractions at practice, you will need to practice and develop your imagery skills and get really strong at this first! This is probably something you’ve already tried before! But I’ve got some specific images you can use to really help you be at your best on bout day. controlling emotions during penalties, etc. Again, no matter what moment you are visualizing you want to be in control of these images. Visualize success! Just as visualization can be used to prepare for competition, it can also be a useful technique to help review your performances. After a game (or even a practice! ), you might have the opportunity to watch videos of your performance. With the new footage you can use visualization to help break down key elements in your technique: What worked? What didn’t work out so well? With those new images you can engage in visualization sessions to help break down certain techniques, as well as help correct mistakes. Visualization is my favourite mental skills technique because, as you see, it can be used in a variety of ways. Visualization can help you develop and strengthen your confidence, focus, and even self-regulation. I challenge you to add some visualization into your mental skills training regime this week!! Start small and with a goal. Just remember to keep those images realistic, positive, and in control. Leave me a note in the comments and tell me when and where you’ll try a visualization session this week, and what goal you’ll have, going in!